Brighton, R., Brown, A., Froggatt, T. & Liersch, S. (2011). 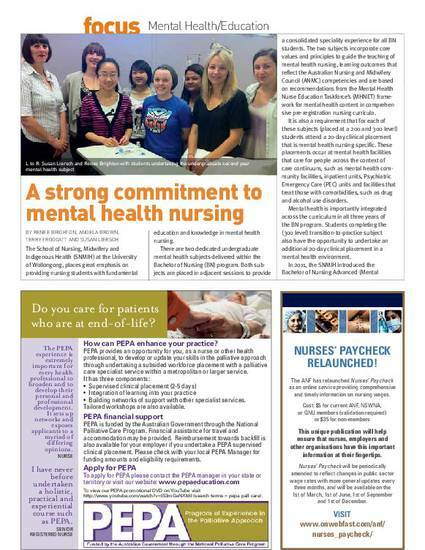 A strong commitment to mental health nursing. Australian Nursing Journal, 19 (4), 40-41. The School of Nursing, Midwifery and Indigenous Health (SNMIH) at the University of Wollongong, places great emphasis on providing nursing students with fundamental education and knowledge in mental health nursing. There are two dedicated undergraduate mental health subjects delivered within the Bachelor of Nursing (BN) program. Both subjects are placed in adjacent sessions to provide a consolidated speciality experience for all BN students. The two subjects incorporate core values and principles to guide the teaching of mental health nursing, learning outcomes that reflect the Australian Nursing and Midwifery Council (ANMC) competencies and are based on recommendations from the Mental Health Nurse Education Taskforce’s (MHNET) framework for mental health content in comprehensive pre-registration nursing curricula.